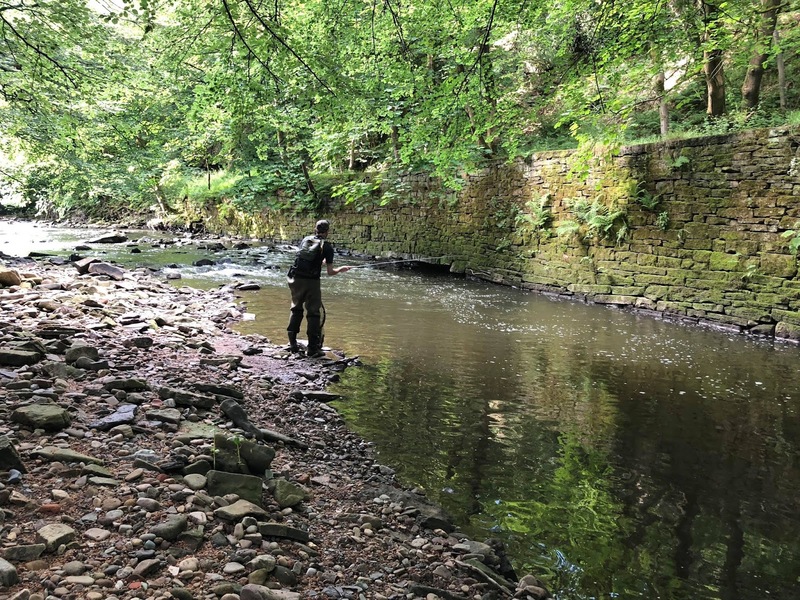 Fishing the Irwell - An Urban Fly Fishing Journey: Is the Irwell making a comeback? 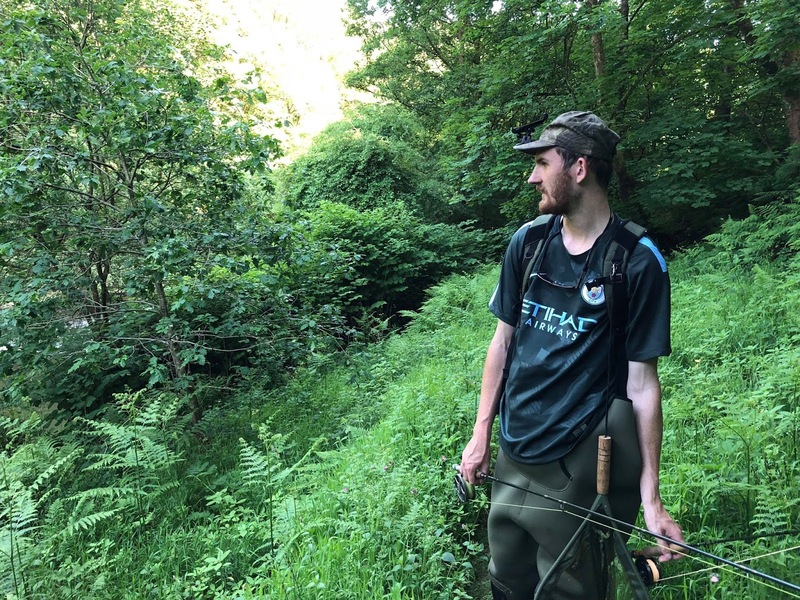 Things have been quiet at my end on the blog front for a few week, i have been fishing a couple of times, just on my locals, i found rising fish and were getting well into double figures of them. It was nice to finally get fish on a dry regardless of the size. The size however is still very small. At least they have spawned well but it does make me worry about the bigger ones especially with the increase in poaching. 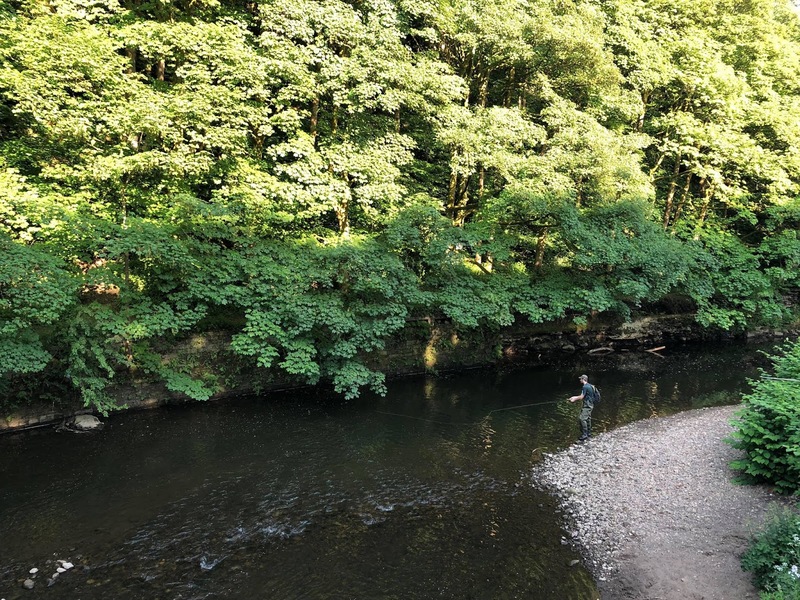 The Irwell at my end, however, has proved to be very poor, missing 1 fish and losing a tiny one in the fast water. However my friend Al Meer offered to take me a little further up river. It was the first time i'd met Al in person despite having been on social media for a few years and it was a pleasure to meet and fish with him finally in person. We was fishing still below the pollution in fact not far from where i discovered the pollution incident on that fateful day. Al told me he had only been on this section once before but i can see why he brought me here. The first pool we got to was perfect but being the Irwell and with its complications it wasn't giving in until i finally got an Irwell fish. It was only small as expected, like the ones i had been catching elsewhere but it was a fish. We spotted a lone rise under the tree but the pool didn't live up to it's expectations like it would of done 2 years ago. Moving on we found many beautiful runs and some of them were just a little too, bedrocky, but when we found them proper fishy pools where the conditions were right we knew there would be fish. Al opted to choose between a lone nymph or wet fly while i stuck with the klink n dink method to keep the nymph in the narrow foam lines. I had 2 more fish in the next pool, again of small size. Al would be the next to catch after a switch to a heavier nymph, the pool we was in was still in a state of autumn, the ground was crisp and brown with seeds and such. I tried the same spot and lost 1 fish and missed a bigger fish at the head of the pool. While Al landed another slightly downstream. We explored some more sections but ignored alot of the bed rock runs and alot of it was also inaccessable unless we waded the full length. After catching another small fish we headed back to the car, we had hiked a long way, up steep hills and on narrow paths over steep drops. Reaching the first pool Al let me give it another shot and it was very quiet. So i headed over to the spot i saw the rise a few hours earlier, it was well under a tree with barely a foot between the branches and the water but i cast into the current. The eddy effect pulled my klinkhammer out of the current and into the slower swirling water. Then a big ol' trout hit the dry so fast and hard i bloody jumped and missed setting the hook. Caught off guard at the end of the day, typical but it was a good day regardless for me. So how is the Irwell doing. Fly life is increasing, not many big flies but it is definitely an improvement. Minnows are shoaling up and were showing an increase in their numbers and also i spotted thousands of tiny little fry in the shallows showing that at the moment things are doing ok. The fish will get bigger, the big fish will return even though some are still there hiding and in time it will be back to how it was. As long as nothing happens again. It was nice to finally catch trout below the pollution. It was great to meet Al and it was especially enjoyable in the surroundings we were in. Miles away from anyone. It was a tiring day of exploration for us both especially in the heat but when your near the river, catching trout regardless of size, the sound of the river flowing past and the tweets of a nest of young birds as their mother flies off to find food only metres away. 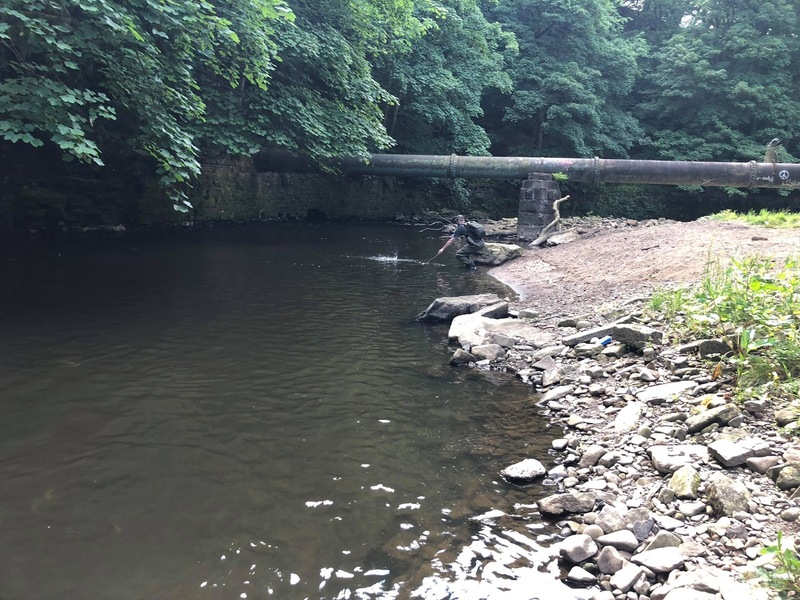 I sat and watched Al fish, both to rest and to reflect, the Irwell holds many secrets, it has been punished and tortured but long before that it would of flourished. 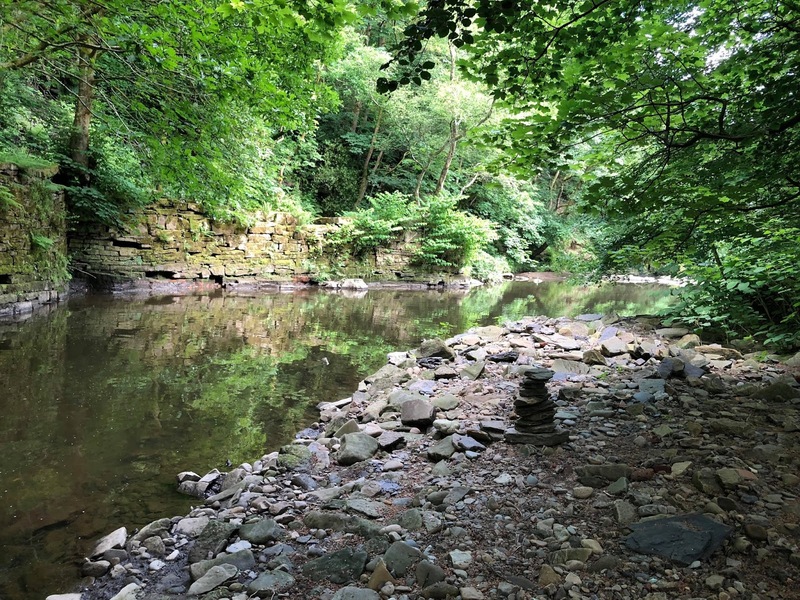 Every fallen rock and boulder has its own story and thankfully they cannot speak of the pain the river has endured for it be to tortueous for us to hear. There is a time i hope that everything can be reversed but while money is so easy to take from us it is hard for the government to spend it on our final wild frontiers.